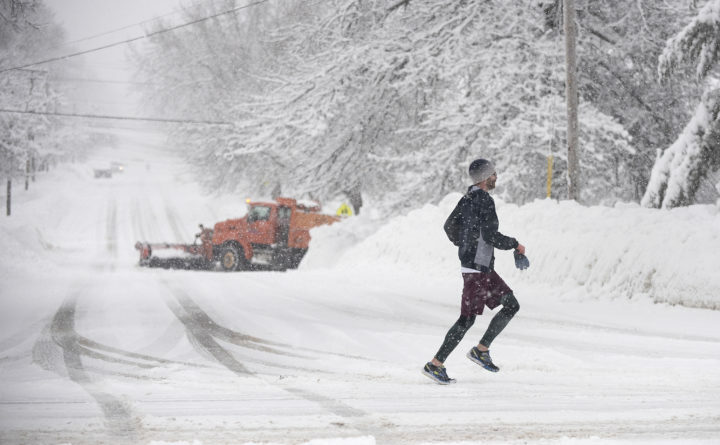 Nick Innis jogs on Buck Street in Bangor as snow comes down, March 13, 2018. Residents of northern Maine can expect more snow from the first storm of the season than initially thought, according to the National Weather Service. Tuesday afternoon, the NWS Caribou office upgraded an earlier advisory to a winter storm warning forecasting heavy mixed precipitation with total snow accumulations of 3 to 7 inches and the potential for localized amounts up to 10 inches for southeast Aroostook, northern and central Piscataquis, and northern Penobscot and Somerset counties. The affected area of the warning includes the communities of Houlton, Sherman , Patten, Millinocket, and Greenville. A winter weather advisory for the rest of Aroostook, northern Somerset, central Penobscot, southern Piscataquis and northern Washington counties now calls for accumulations of 1 to 3 inches, with up to 6 inches in some spots. The storm warning is in effect from midnight Tuesday through 2 a.m. Thursday. The Bangor Daily News is pleased to feature content from our sister website, The County. To read the rest of “Meteorologists forecasting up to 10 inches of snow Wednesday in northern Maine,” an article by The County staff writer Jen Lynds, please follow this link to The County online.